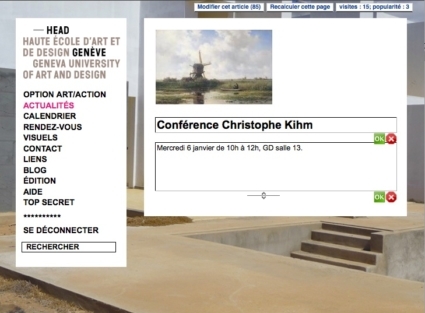 January 2010 – Release of a revised version of the Arts/Action website, created for Option Art/Action, a department of the University of Arts Geneva, the focus being on simplicity, usability, and coherence with the theme of the institution’s main website (developed in 2007 by Cyrille Kazis and OpenStudio.fr). 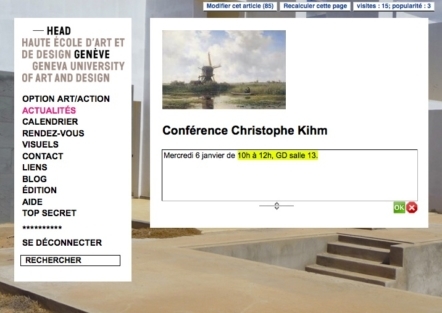 The previous version of Art/Action was the first website I designed using the SPIP content management system, in 2008. New features: an editable “meetings” section (will see how long we can leave it truely open before it gets spammed), improved cross-browser support for the liquid layout, a re-organized “visuals” section, a HTML5 doctype …. For the background picture adjustment, I’m using the excellent “supersized” jQuery script by Sam Dunn.